Muller corner yoghurts - We always have some yoghurts to take to work, these just happened to be on special at Tesco this week. Richmond sausages, ready for toad in the hole later. Fresh rhubarb so I can make either a tart or a crumble at the weekend. In the bottom drawer there is some stir fry veggies and some diced turnip to go in a stew later in the week. Mild Cheddar - my other half is afraid of all other cheese. cold butter for pastry purposes. Selection of condiments - Mustard, sweet chilli, mustard mayo, light mayo. Most of a bottle of gross rose wine I bought at the chip shop on Friday and it is disgusting. So there you have it! A glimpse into my life and my kitchen. What are your kitchen staples? 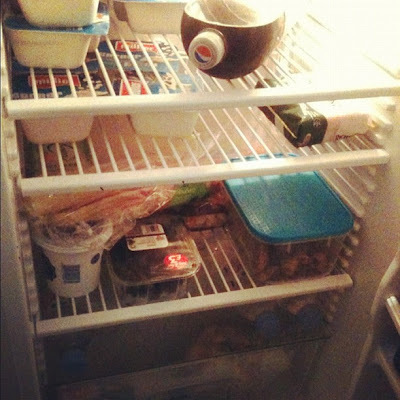 Who know, I may do a series and show you my freezer next! Or my (overflowing) baking cupboards! I can tell you are super excited! Fabulous. So pleased you joined in. Love that you know what everything is going to be used for - I knew yours would be so much tidier than mine! And wine from the chippy?! Mine may be tidier but nowhere near as full! 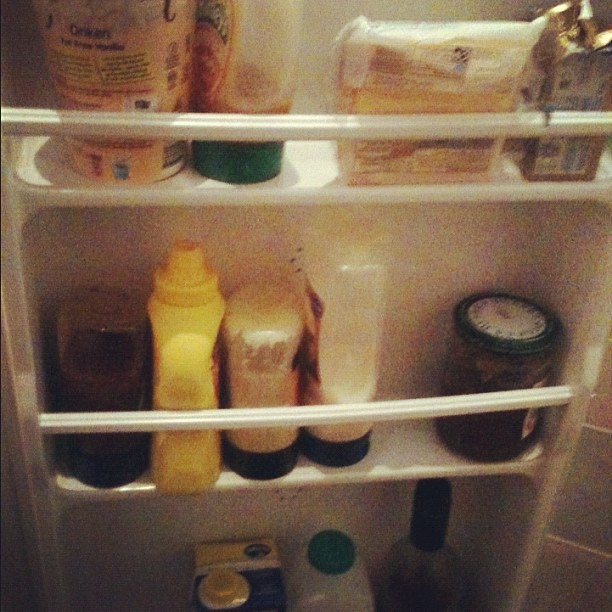 Positively empty, mine always seems to be stuffed full (mainly with large blocks of cheese - see my 365 pic from 13th Jan. There are only three of us now, but sometimes I think I still shop for 5!